lan Stevenson, civil engineer, eldest son of Robert Stevenson, and brother of David Stevenson and Thomas Stevenson, was born at Edinburgh in 1807. Educated at the high school and university of Edinburgh, where he greatly distinguished himself, he graduated M.A. on 30 March 1826, and obtained, under Sir John Leslie (1766-1832), the Fellowes prize as an advanced student in natural philosophy. With the view of entering the church, he continued his studies under a clergyman at Twickenham, but eventually resolved to follow his father's profession, and became a pupil in his father's office, at the same time gaining experience in practical engineering. After entering into partnership with his father, he was engaged in general engineering practice, especially in connection with marine works, such as piers, harbours, and river and estuarial improvements. 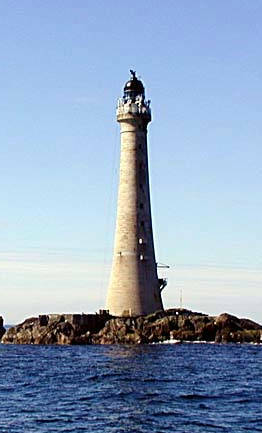 Two images of Skerryvore light from Wikipedia. Left: A photograph by Jim Anderson, Chairman, West Lothian SAC. Right: An unidentified nineteenth-century engraving. He was also engaged on work for the Scottish lighthouse board, and in 1843 succeeded his father as engineer to the commissioners. 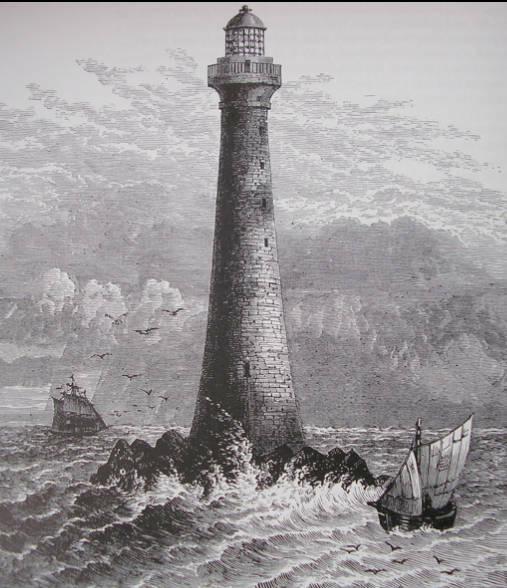 He designed and carried out ten lighthouses, including Skerryvore lighthouse tower, the finest example for mass, combined with elegance of outline, of any extant rock tower. This tower, which is exposed to the full fetch of the Atlantic, is built on a rock fourteen miles from the nearest land, the island of Tyree. The work was begun in July 1838, but a storm swept away the temporary barrack, and another had to be erected in its place. The foundations of the tower involved the excavation of two thousand tons of material. The first stone was laid in July 1840, and the light exhibited in 1843. The rearing of this structure, containing upwards of 4,300 tons of granite, occupied three seasons, each extending to about two months, and was personally superintended by its author. The tower rises to a height of 138 ft., is 42 ft. in diameter at the base, gradually decreasing to 16 ft. at the top. The 'solid' or monolithic part extends to 26 ft. above the rock, the cubic contents of which are double the entire contents of Smeaton's Eddystone tower. The walls, as they spring from the solid, are 9 ft. in thickness, gradually diminishing to 2 ft. The interior is divided into ten floors, including the light-room, each 12 ft. in diameter. The optical apparatus is dioptric revolving, the most complete which had hitherto been constructed; the height of the eight central lenses was extended to 3 ft. 3 in., and, instead of Fresnel silvered mirrors below the lenses, Stevenson designed prismatic rings, which were introduced for the first time in this apparatus. Stevenson designed and carried out some notable improvements on dioptric apparatus used in lighthouses. For the central portion of the fixed apparatus he converted Fresnel's narrow lenses into a truly cylindrical drum, which he divided into sections with helical joints; and he introduced prismatic rings above and below the central belts, thus securing equal distribution of light all round, and extending dioptric action throughout the whole height of the apparatus. He also suggested the spherical mirrors placed on the landward arcs of dioptric apparatus. In 1830 Stevenson became a member of the Institution of Civil Engineers, and in 1838 a fellow of the Royal Society of Edinburgh, acting as a member of its council from 1843 to 1845. In 1840 the university of Glasgow conferred on him the honorary degree of LL.B. The emperor of Russia and the kings of Prussia and Holland presented him with medals in acknowledgment of his merit as a lighthouse engineer. In 1848 was published his Account of the Skerryvore Lighthouse, with Notes on the Illumination of Lighthouses, 4to. It still remains a standard book. The notes on lighthouse illumination were subsequently extended and published in 1850 under the title of A Rudimentary Treatise on the History, Construction, and Illumination of Lighthouses. Stevenson had fine literary tastes. He knew Italian, Spanish, French, Greek, and Latin literatures thoroughly. In 1852 he was seized with paralysis, and thenceforth beguiled his suffering by translating the ten hymns of Synesius, bishop of Gyrene. These translations, along with other poems, were printed for private circulation the year before his death. He wrote articles for the Encyclopaedia Britannica (8th edit.) on lighthouses and other subjects. Stevenson died at Portobello on 23 Dec. 1865. On 3 Jan. 1866 the commissioners of northern lighthouses recorded in their minutes ' their deep and abiding regrets for the loss of a man whose services had been to them invaluable/ and whose works combined profound science and practical skill. The Dictionary of National Biography Vol. 54. Ed. Sydney Lee. London: Smith, Elder, 1898. Internet Archive web version of a copy in the University of Toronto Library. Web. 7 October 2014.